Play Bingo for FREE on your Birthday! Includes 12 up admission book. 8 Green Letter "X" Jackpot 23 #s or less starting at $250 ($50 added to pot each night) ??? Must purchase the following Bingo Paper to qualify for PHD Packages. Sign up today! Application is located in the lobby. Once completed, please give to the Supervisor. Earn points every time you play bingo! To win the Toonie ball prize, you must bingo on the last number called. 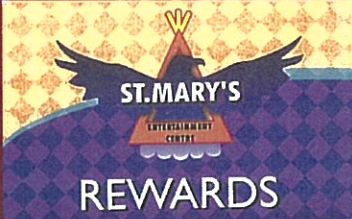 No refunds or exchanges for unused or unplayed paper, unless approved by management. 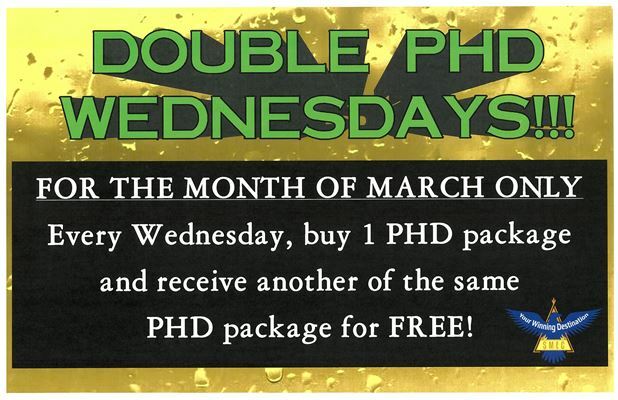 PHD purchases are possible only after the purchase of a 12 up Admission book and 2 Special Packs. Use of illegal drugs is prohibited. Individuals not adhering to this rule will be asked to leave and their admissions will not be refunded. The manager has the right to implement the “STORM SESSION”. Ask for details. Alcohol consumption is not allowed during bingo and restricted to the restaurant and lounge areas. Players may check balls prior to the start of Bingo. Persons 16 years of age or older are allowed to play Bingo. STORM SESSION – in effect when Bingo attendance is 70-105 people. - $100 Regular Games, all specials 50/50, $1000 Jackpot. - If attendance is under 70, bingo is cancelled.